If you're wondering how to make a vegan cake, we have the perfect recipe. 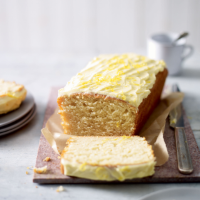 Ready in under an hour, this moist, fluffy frosted lemon cake makes a great vegan treat, particularly with a cup of tea. 1. Preheat the oven to 180ºC, gas mark 4. Grease a 12.5cm x 23cm (900g) loaf tin with a little oil and line the base with parchment paper. 2. Sift the flour, baking powder and a pinch of salt into a large bowl. Stir in the sugar. 3. Whisk the oil, Alpro Soya, lemon juice and half the lemon zest together, then fold the mixture into the dry ingredients to make a smooth batter. Pour the batter into the tin and bake for 40 minutes, or until a skewer inserted into the centre comes out clean. Allow to cool in the tin for a few minutes then turn out onto a wire rack, remove the paper and leave to cool completely. until smooth. Reserve a pinch of lemon zest, then fold the remainder into the frosting and spread over the top of the cake. Finish with a sprinkling of lemon zest on top and serve. If you like you can substitute the lemon with orange or lime to vary the flavour of the cake. This recipe was first published in Tue Sep 15 12:49:00 BST 2015.